Human brain is the upper part of the central nervous system (CNS). The CNS controls and coordinates the functions of the internal organs of the body and responds to the stimuli of the external environment. The human brain is made up of three components: the cerebrum, the brainstem, and the cerebellum. It is protected by the skull bones of the head. 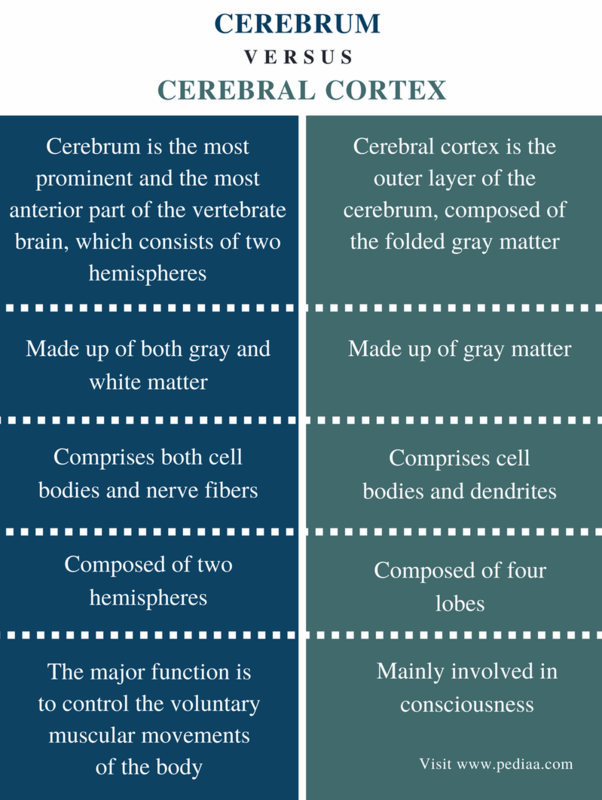 The main difference between cerebrum and cerebral cortex is that cerebrum is the largest part of the brain whereas cerebral cortex is the outer layer of the cerebrum. The cerebrum comprises two cerebral hemispheres. The cerebral cortex is made up of gray matter that covers the internal white matter. Cerebrum refers to the most prominent and the most anterior part of the vertebrate brain, which consists of two hemispheres. The two hemispheres are separated by a fissure. Corpus callosum is the large neuron bundle that connects the two hemispheres. The two types of nerve tissues in the cerebrum are gray matter and white matter. The gray matter occurs on the outside of the cerebrum and is called the cerebral cortex. It contains cell bodies and dendrites of the neurons in the cerebrum. The white matter is found beneath the gray matter and contains nerve fibers. Cerebrum accounts for 4/5 of the total weight of the brain. The two hemispheres of the cerebrum are shown in the image 1. Each hemisphere further divides into four lobes: frontal lobe, parietal lobe, temporal lobe, and occipital lobe. The three fissures that separate the four lobes from each other are the central fissure, Sylvian fissure, and the parieto-occipital Sylvian fissure. The main function of the cerebrum is to control voluntary movements of the body cooperatively with the cerebellum. The four lobes of a cerebral hemisphere are shown in figure 2. The front lobe is responsible for planning, awareness, organization, speech, and emotional expressions other than voluntary movements. 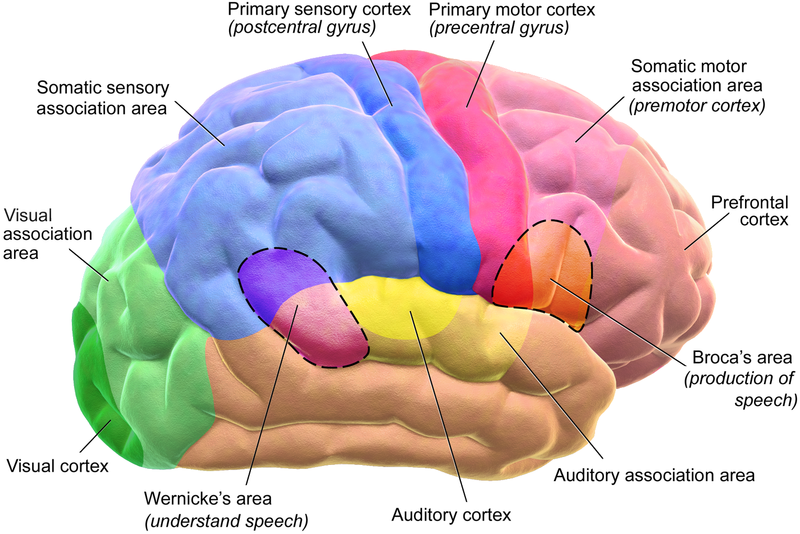 The temporal lobe contains the auditory cortex. The parietal lobe contains a motor cortex, involved in the somatosensory perceptions. In the somatosensory perception, the body responds to the senses obtained from visual, acoustic, and memory functions. The occipital lobe contains the visual cortex. Generally, the right side of the brain controls the left side of the body while the left side of the brain controls the right side of the body. The left cerebral hemisphere is responsible for writing, language, speech, and linear sequential processing. However, the right cerebral hemisphere is responsible for music, drawing, emotions, visual-spatial activities, and parallel processing. Cerebral cortex is the outer layer of the cerebrum, composed of folded gray matter. It plays a major role in consciousness. The cerebral cortex is composed of gray matter that is 2 – 5 mm in thickness. Since most of the cell bodies and their dendrites are located in the cerebral cortex, it is responsible for the most of the functions in the cerebrum. The cerebral cortex contains more than 10 billion nerve cells. The outer surface of the cerebral cortex is highly convoluted, increasing the surface area of the cortex. The ridges of the convolutions are called the gyri whereas the depressions are called the sulci. The motor and the sensory regions of the cerebral cortex are shown in figure 3. Based on the functions, the cerebral cortex contains three regions: motor, sensory, and associative regions. The sensory nerves end up in the sensory region of the cerebral cortex. The received information is processed and is sent to the associative regions. The associative areas are responsible for the integration and interpretation of processed information. These areas are also responsible for planning, memory, evaluation, and complex thoughts. The motor areas are responsible for the coordination and execution of muscular movements. Both cerebrum and cerebral cortex are two components of the forebrain. Both cerebrum and cerebral cortex are important in the coordination of functions of the body. Cerebrum: Cerebrum is the most prominent and the most anterior part of the vertebrate brain, which consists of two hemispheres. Cerebral Cortex: Cerebral cortex is the outer layer of the cerebrum, composed of the folded gray matter. Cerebrum: Cerebrum is the most prominent part of the brain. Cerebral Cortex: Cerebral cortex is the outer layer of the cerebrum. Cerebrum: Cerebrum is made up of both gray and white matter. Cerebral Cortex: Cerebral cortex is made up of gray matter. Cerebrum: Cerebrum comprises both cell bodies and nerve fibers. Cerebral Cortex: Cerebral cortex comprises cell bodies and dendrites. Cerebrum: The cerebrum is composed of two hemispheres. Cerebral Cortex: The cerebral cortex is composed of four lobes: frontal lobe, parietal lobe, temporal lobe, and occipital lobe. Cerebrum: The major function of the cerebrum is to control the voluntary muscular movements of the body. Cerebral Cortex: The cerebral cortex is mainly involved in the consciousness. Cerebrum and cerebral cortex are two most prominent regions of the brain. They constitute the majority of the forebrain. Cerebrum is the two hemispheres of the forebrain, which coordinates the voluntary muscular movements of the body. 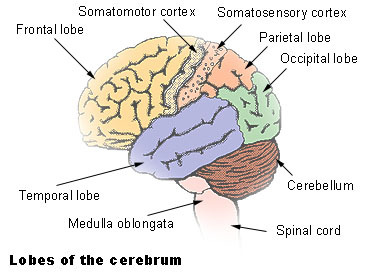 Cerebral cortex is the outer region of the cerebrum, containing most of the cell bodies of cerebrum. The main difference between cerebrum and cerebral cortex is the constituents and function of each region in the brain. 1. “Cerebrum – Brain.” Innerbody, Available here. 2. Bailey, Regina. “Brain Anatomy: Cerebral Cortex Function.” ThoughtCo, Available here.